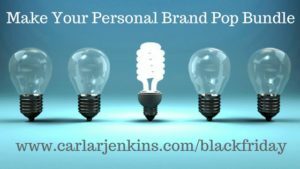 Posted bycarlarjenkins	 November 27, 2017 November 27, 2017 Leave a comment on Make Your Personal Brand Pop With This Bundle! It’s the end of the year. You are thinking about slowing down, taking it easy and enjoying family time. Great but you are also suffering from FOMO (fear of missing out). Although you can live without reporting to the office for a couple of days, you feel that people are making moves without you or that your competition are one upping you. You are seriously fretting about how do I stay top of mind without being around. The answer is simple: develop your personal brand. The definition of your personal brand is what people say about you when you are not in the room. Before you suffer a FOMO panic attack, ask yourself what you do you think your coworkers will say about you? You can also use BLACKFRIDAY today ONLY to get 15% off with the bonuses! No worries because the Make Your Personal Brand Pop video bundle will help you out! We are living in an Internet society where technology is interwoven everywhere. We use our phones to make videos, schedule appointment, conduct teleconferences and instant message people. However, none of these functions will ever supplant face-to-face communication. 5 reasons why face-to-face communication still wins first place. You aren’t a slouch. You are highly invested in yourself and your career. However, for the life of you, you can’t understand how you keep going in circles. You have tried everything. You’ve read every book and signed up for every professional training but gotten nowhere. I was once there. There is a way out. It doesn’t have to be this way. 5 ways to stop struggling and start succeeding. I discuss the importance of Content Marketing as a professional. There are many ways of promoting your personal brand. You can blog, podcast or do video. Make sure that your content is cohesive. Many people know how to use Facebook but few really know how to use Facebook Live for their brands. Well, I am here to help you with that. Think of Facebook Live as a way to enhance your customer’s experience. Career management is not a one-time event. You have to continually stay current regarding your own skills and your industry. Whether you feel like it or not, you will have to reinvent yourself in order to keep working. A personal SWOT analysis is just the tool to smoothly guide you from one career reinvention to another.